To delve into the history of the Huddle family and the four custom Jarrett Bay boats they’ve commissioned, is to take a journey from the company’s very beginnings and discover some of the underpinnings of Jarrett Bay and Bluewater’s explosive growth and success throughout the last thirty years. Ever since they were young men, Harris and Carl Huddle grew up fishing and hunting with their father Jack, a seasoned outdoorsman and construction foreman by trade. In those early years, Mr. Huddle owned a few modest productions boats, a Bertram 31 and then a Phoenix 29, called Jack’s Boat because his wife, Barbara, wouldn’t dare go near it! 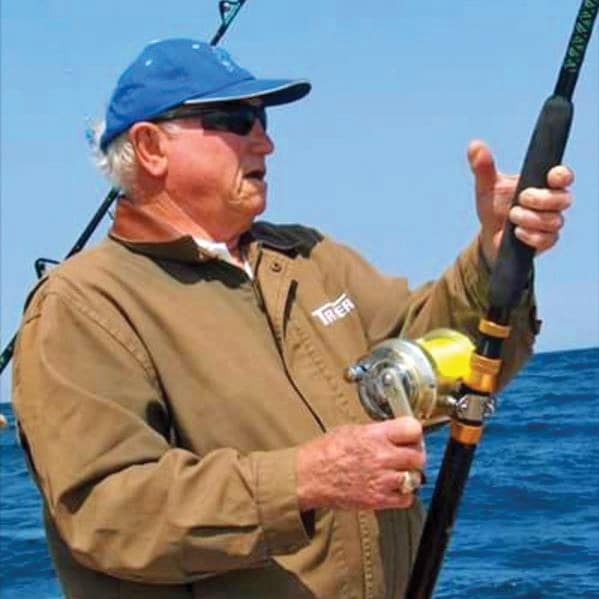 Fishing and hunting was a means to help fill the freezer for Jack, and his boats were largely just a tool in that pursuit; providing for his family while also enjoying the Crystal Coast’s many bounties. The Huddles kept their boat at Calico Jacks Marina on Harkers Island, NC where Jack came to meet an ambitious young charter captain by the name of Randy Ramsey. At the time, Randy was running an aging custom convertible, Starflite, and had just embarked on building a new 53- foot replacement with Jim Luxton and a band of friends. They built this first boat over the course of a few off-seasons with the kindly input of Outer Banks legend Omie Tillet and Glen “P-Nut” Haught, and upon launch, it quickly, and quite literally, became a sensation. Jack admired what they achieved with the design and execution of the Sensation and closely followed the progress of the next couple hulls the men built. At the same time, the seeds of Jack and Randy’s friendship were being scattered along the Gulf Stream’s many winding weed lines, with the two exchanging information, encouragement, and a healthy portion of razzing over the VHF while in search of fish. They also got to know each other a little better back at the docks of Calico Jacks, until one particular conversation spooled up the turbos on their relationship. Randy recounts, “Jack walked into the tin shed in Williston where we started and asked about ‘getting one of these boats.’ After a few minutes, he gave me the basic layout of the 43’ boat he had in mind and asked ‘how do we start?’ Little did I know that this day would change the course of our company’s history.” Randy proposed to build the boat for $12 per hour, plus a 10% mark up on materials— when he wasn’t running charters. 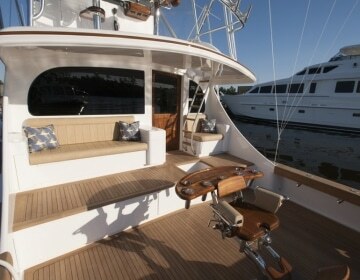 Jack agreed that was a fine arrangement, the two shook hands, and construction commenced on Jack’s first custom Jarrett Bay, the 43’ Builder’s Choice. During the construction of this first boat, as well as the subsequent builds, Jack and his son Harris became frequent visitors at the Jarrett Bay shop, stopping by to inspect the progress almost daily on their way home from a work-site or the marina. 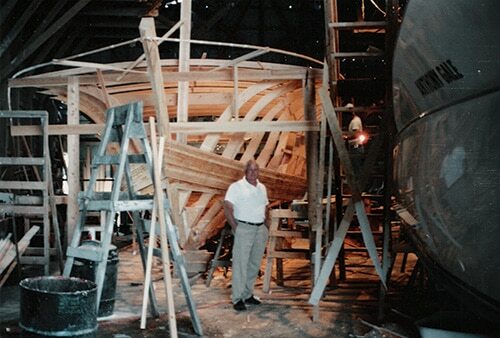 Randy remembers, “Building a boat for Jack was a lot of fun because he was always very involved. He was quite resourceful and always willing to drop by with any type of materials or tools that might be helpful to us. He was a born leader and just had a way about him, that we just always wanted to do the very best we could for him. 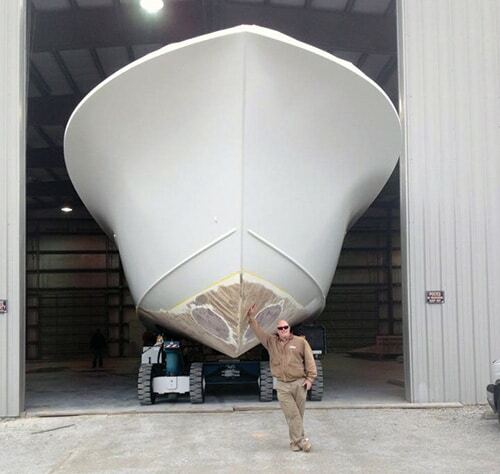 Not only were Jack’s fingerprints all over his first boat that Randy and team built, but they ;extended onto many facets of the company’s boat building operations throughout the years. Upon his many visits, Jack became familiar with the various detractors of the group’s first facility, such as a leaky roof and the dirt floor. He felt they could do better, offered his help, and eventually persuaded Randy to scout some possible new locations. They zeroed in on some land in Marshallberg, NC which Jack purchased, and on which his company Trader Construction built several buildings. He then rented this new 60’ x 80’ building to Randy for the same low rate Jarrett Bay was paying back in Williston. Over time they added on, and Mr. Huddle acquired more land around the area, about three acres all-told, as well as a travel lift, so his tenants could start to make this arrangement more profitable by servicing others’ boats. After a few years, Jarrett Bay was able to buy the property from him—primarily because Jack gave them a sweetheart of a deal. Later in the company’s history, he was also instrumental in helping to develop the parcel that has become Jarrett Bay’s sprawling 175 acre marine industrial park on the ICW in Beaufort. So back to the boats—the 43’ convertible (Jarrett Bay hull 5 splashed in 1990), 48’ express (hull 20 launched in 1996), 55’ convertible (hull 40 delivered in 2002) and the 2015 64’ (hull 59). Harris explains that Jack primarily ran the first Builder’s Choice, but as they both got older, father and son started sharing the captaining duties on their next boat. Jack commissioned that larger express largely so he could be closer to the family and anglers while fishing, instead of isolated up on the bridge. By the time the Huddles moved up to the 55’ convertible, Harris was fully entrenched as the full-time Builder’s Choice Captain, and as such, was very involved in the build process. His brother Carl landed more on the hunting side of Jack’s legacy, but Carl’s son, Jack (JC) actively started fishing as soon as he was old enough and is now the first mate for his Uncle Harris. This newest Builder’s Choice (the first to be commissioned by Harris after Jack’s passing) stays simple in some ways, but in the grand scheme of things, represents a dramatic change in styling from Jack’s first boat. Much as he would have done, the Huddle family collaborated frequently on layout decisions and interior appointments, and even found a way for Jack to posthumously leave his mark, by engraving the salon coffee table with his signature. For all the craftsmen at Jarrett Bay, the 64’ Builder’s Choice is a highly functioning piece of art to be supremely proud of, and even sentimental about, after leaving the facility. Jarrett Bay new construction foreman Gary Davis may have said it best, “Delivering a boat we’ve worked on dayin and day-out, for years, is like walking your daughter down the aisle.” But as in all quality relationships, the Jarrett Bay team knows the bride will eventually return home–perhaps often–just as the Huddle family has proven to. After taking delivering of the 64, the Huddles cut chase to Florida, where it debuted in the Fort Lauderdale International Boat Show and wintered in Palm Beach at Sailfish Marina. The family took frequent short trips through the Winter and into Spring 2016, and enjoyed bloodying the new decks for the first time with a large dolphin, “a meatfish, just like Big Jack would have wanted,” reported JC. From Florida, the boat will move back to her home waters of North Carolina in the spring, and prepare for the tournament season, fishing many of the NC Governor’s Cup events such as Swansboro and Hatteras Village, before the Big Rock, Barta, Pirate’s Cove and Virginia Beach tournaments.